It’s far from being the most affordable offering in this segment, but the Toyota Sienna offers quite a lot to help justify that premium. For starters, it’s spacious even for MPV standards (the cargo capacity with all seats in place is particularly impressive), and the car’s ride/handling balance is very well judged for what will be demanded of the minivan in day-to-day life. Better still, the flexible powertrain’s been given an extra dose of power for the 2017 model year, and there’s a class-exclusive optional all-wheel drive system too. 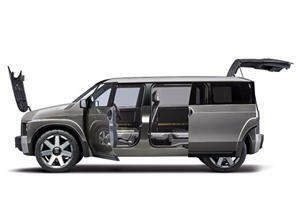 MPV buyers who are after the plushest interior possible may be disappointed with the Toyota Sienna’s cabin. Whilst it’s far from being poorly assembled, the abundance of hard plastics and the slightly dated control layout on the center console do bring down the premium ambience somewhat. Still, the overall fit-and-finish is as you’d expect from a Toyota, and the controls themselves are intuitive to operate. The space on offer is pretty versatile too: loads of storage bins are available, and there’s plenty of adjustment and height in the seats. Cargo capacity also impresses, with 39.1 cubic feet available with all seats in place (extending to 87.1 with the third row folded flat, and a gargantuan 150 cubic feet when you also fold the middle row away). 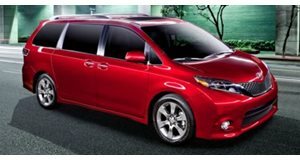 Befitting the handling attributes associated with MPVs, the Toyota Sienna is far from being a dynamic and engaging vehicle to drive. As a day-to-day workhorse, though, the Toyota is more than up to the job: handling response is tidy, courtesy of the light controls, and the ride strikes an acceptable balance between comfort and keeping the mass of the vehicle in check when cornering and driving over undulating surfaces. Sportier suspension comes on Toyota Siennas in SE spec, but this does make the ride overly firm. All-wheel drive can also be specified as an option, and will be handy to buyers in colder states. Refinement levels are quite good and the large windows means visibility is sufficient for the most part too, but the thick rear pillars do generate considerable blind spots. Though the overall capacity remains identical to previous Toyota Sienna’s, the 2017 model year car’s 3.5-liter six-cylinder gasoline engine gets some extra grunt over previous iterations. Now with 296-horsepower and 263 lb-ft of torque, the already versatile engine now has even more flexibility. Plus, it’s a very smooth and refined engine that suits the Toyota Sienna’s more laid-back driving characteristics. Fuel economy’s pretty good too, with claims of up to 19mpg in the city and 27mpg on the highway (reduced to 18mpg city/24mpg highway when all-wheel drive is installed). A new-for-2017 eight-speed automatic transmission replaces the old six-speed unit, but sadly isn’t particularly smooth or seamless when changing gears as comparable transmissions in some rivals. The Toyota Sienna is amongst the most expensive MPVs in this class, though it’s worth stating the spec levels are pretty satisfactory. The base £29,750 ‘L’ trim includes niceties like a reversing camera and three-zone climate control, with the $32,540 ‘LE’ (our pick of the range) introducing built-in navigation and a power-adjustable driver’s seat. The Toyota Sienna also fares well when it comes to safety, having been awarded the full five stars in its most recent NHTSA crash test. It’s also worth pointing out that the Toyota Sienna has the best predicted resale values in this class – though how much you’ll get back for your car will vary, depending on the spec, the condition and market demands come resale time. With fresh-faced and less-expensive MPVs now on the market, the Toyota Sienna is starting to lose its competitive edge. That said, there’s still a lot to like about the Toyota Sienna overall (especially if you really need the traction benefits that come with an all-wheel drive system). As a result, whilst we can’t call it the best-in-class, the Toyota Sienna is still worth considering. A closer look at the details shows this thing is easily doable.